Excellent emplacement pour vos vacances de ski. Emplacement, emplacement, emplacement! C'est l'une des meilleures caractéristiques de notre maison de ville chaleureuse et confortable. Vous resterez sur la ligne de bus gratuite où vous serez à la base de Deer Valley Resort en 3 minutes. Vous pouvez également marcher jusqu'à Main Street en seulement 5 minutes. Cette maison de trois niveaux vous permet d'étaler et de profiter de votre séjour. Trois chambres et un salon le rendent très confortable pour 6 à 8 personnes. Nous pouvons également accueillir un bébé ou un bambin. La chambre Penthouse comprend un berceau et des jouets. Nous avons également un pack-and-play et une chaise haute qui s'attache à la table à manger. Au niveau principal, profitez d'un salon chaleureux avec une cheminée à bois et une table à manger pour 6. La cuisine est ouverte avec un bar et vous permet de cuisiner et de visiter avec vos invités. Nous apprécions vraiment notre temps à notre maison de vacances et sommes heureux de vous ouvrir le Gambler pour votre séjour. We enjoyed the condo very much. The location is ideal (right in front of the bus stop). Never waited more than 5 minutes. Parking was perfect. Bedrooms were comfortable and all had their own bathroom. Kitchen had everything we needed. Jacuzzi right out our door. Would have been better if the kids room had a door and didn’t have to walk thru there to get to the 3rd floor bedroom. Some areas were warm when others were cold due to the single thermostat and fireplace wood had to purchased separately. Overall, very easy and comfortable. Owner was very responsive too. Thank you. The condo was very spacious for our family of five. Three bedrooms and three and a half baths allowed for plenty of room for everyone. Less than a 5 minute drive to Deer Valley skiing or to Main Street. Everything was clean & comfortable. We would definitely stay here again. Elizabeth T.Where do you live? My husband and I, along with our two grown sons, their wives and a 4mo old, a total of 6 adults and 1 baby stayed at this property Jan 5-12. We prepared our delicious dinners and breakfasts each day in the well appointed kitchen that although small had plenty of work space for several people to prepare the food. The dining table was perfect for 6 adults. Th furniture and decorations are casual. If you are looking for granite countertops and a place built in the last 5 years, this is not for you. It reminded me of a place we had in the late 80's. I'm only saying this because the casualness of this place was perfect for a ski getaway for our family. The crib in the queen room on the 3rd fl was handy since we had an infant. The queen bedroom on the second floor was open to the living area, that was not a problem for us since we all turned in at the same time. The other sleeping area on the second floor was 2 twins. Although no doors to close off that area, they did have their own bathroom and shower which was more important to us. The laundry is on the second floor, also important for all the ski clothes that needed to be washed. The parking garage is under the building. Beware it has low clearance, as indicated in the photo, which we missed. So our Chevy Tahoe with a ski rack did not fit. Luckily the rental company let us switch out the vehicle to one without a ski rack. The best news, is there is a bus stop with a shelter right outside the building by the garage. Many bus routes stop there and it was valuable as we had nonskiers, and skiers finishing at different times of the day. My husband did not ski so he often dropped us off at the town lift only a few blocks away and only 10 steps up to get on the lift, no lines when we were there. When you ski down in the afternoon, before you go over the bridge, ski to the right down to the street and you can pick up a bus there to the bus stop by the rental. No walking involved, very convenient. We lucked out with excellent snow, over 25 " and mild temperatures, in the high 20's. Everyone in the family liked this place and we would stay there again. Great location for a ski trip! 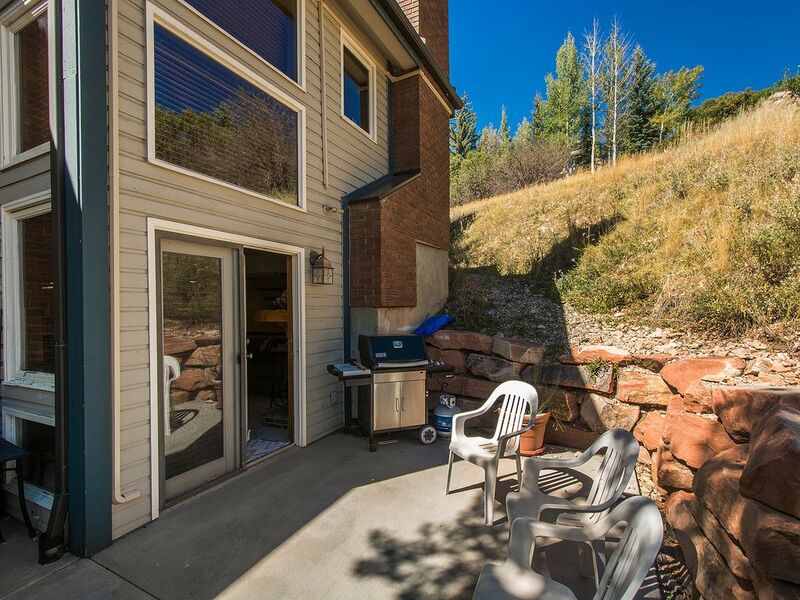 Donald’s property is ideally located with easy access to both Deer Valley and Park City. We had a great time relaxing in the hot tub as well — would definitely recommend! This condo was very comfortable for the 6 of us. Nice furniture and very comfy beds. Loved the hot tub after a day of skiing! It was a 5 minute drive or a10 minute bus ride to Park City Mountain. Very convenient. Excellent Location. Short walk or bus to Main St. and or PC mountain and Deer Valley. My friends and I had a blast, and Donald and wife were very responsive with any questions. Would defiantly go back. Vous pourrez profiter d'un accès rapide aux stations de ski (Deer Valley est à seulement 3 min jusqu'à la rue), mais aussi profiter de votre capacité à marcher au principal Street- 5 min à pied - ou bus gratuit.